The Asom Jatiyotabadi Yuva Chatra Parishad (AJYCP) has reiterated its demand for introduction of Inner Line Permit in Assam to safeguard the demography and ethnic identity of the indigenous people of the State. 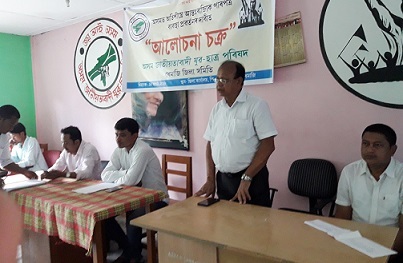 The Dhemaji District Committee of the AJYCP, following the central committee’s instruction, organized a seminar on ‘Introduction of Inner Line Permit (ILP) in Assam’ at its district office here on Saturday. He informed that ILP provision for Indian States was included in the Constitution at the time of its adoption in 1950. Dr Baruah, who referred neighbouring Arunachal Pradesh, said that natural resources and ethnic identity in terms of language and culture was safe due to enforcement of ILP system in the State and it helps in identifying the immigrants and outsiders. He asked the people to learn a lesson from Arunachal Pradesh and urged the people to be conscious about the issue. AJYCP Central Committee executive member Ratul Borgohain said the students’ union since its formation has been demanding the central and State Governments to introduce ILP and dual citizenship in Assam, but there was lack of political will to realise their demands. He alleged that political leader and eminent intellectuals, who earlier realized the necessity of ILP to be enforced in the State, are now keeping mum over the issue for vested political interest. “The politicians are applying divide & rule policy in order to suppress voice of the community organizations on the issue thereby ignoring their demand for last 40 years,” Borgohain lamented while adding that the union has chalked out a plan to sensitise the union members on the issue for public mobilization. Another central committee leader of the students’ union Debajeet Das laid stress on elaborate discussion on their demands with eminent citizens and legal experts. Das felt that necessity of ILP and dual citizenship is important for safeguarding the interest of the indigenous people of Assam. He also put emphasis on ‘concerted effort’ of different community organizations and intellectual forums. Meanwhile, the AJYCP has chalked out an action plan to conduct a series of awareness meetings to sensitize the masses on the ILP and dual citizenship issues covering all anchalik committees within the current year.